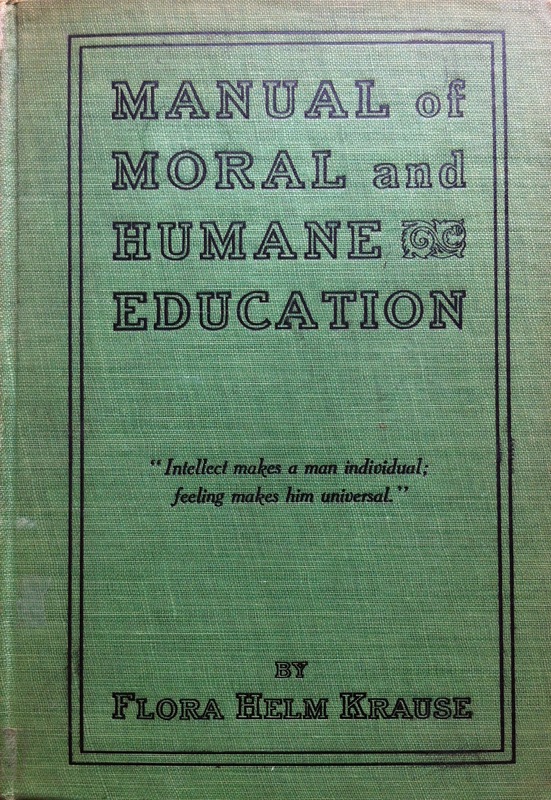 Manual of Moral and Humane Education: June to September Inclusive, a book that would become widely used in Humane Education curriculum in the early decades of the 20th century. It was published by Atkinson, Mentzer & Co. and was distributed in a number of different cities in the United States. The book includes the text of an address that Krause gave at the 33rd annual meeting of the American Humane Association in 1909 as well as a number of chapters that outline her reasons for believing that Humane Education should play a central role in the education of children. She goes beyond the philosophical in this book, however, and offers examples of material and assignments that can be brought in to the classroom at different grade levels. For elementary school children, for example, Krause listed four key areas of Humane Education: nature study, civics, art, and literature, and notes that these are not four distinct categories and that they overlap with and influence each other (22). She gives guidelines as to the amount of time that should be spent on Humane Education in elementary schools: in the first and second grades she suggests 10 minutes per day each school day, however, by the seventh and eighth grades the recommendation is thirty minutes per day, 3 days a week. Art: Monarch of the Glen–Landseer. Literature. Story-telling by some pupil: Tail of the Sand-hill Stag–Ernest Thompson Seton. In the closing sections of the book Krause provides a historical sketch of the anti-cruelty movement and also includes a blank form that readers of this text can use if they have to make a complaint to their local anti-cruelty society. Like a number of other Humane Education initiatives featured in this exhibit, Krause’s book included a large number of images. 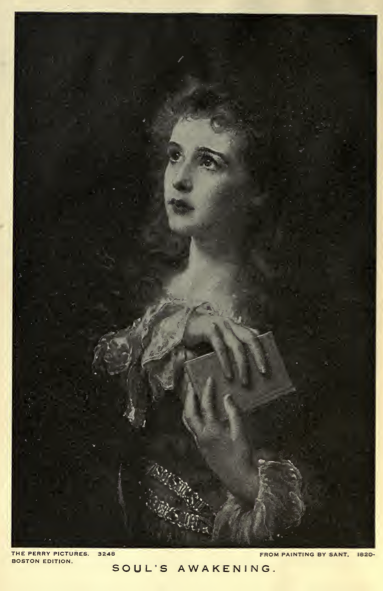 The book opens, for example, with a reproduction of James Sant’s painting, The Soul’s Awakening. Krause’s choice to use this image in this particular context is significant. Sant (1820-1916) was a member of the Royal Academy of Arts in Britain, and became especially known for portraiture after 1872 when he became portrait painter to Queen Victoria. The Soul’s Awakening was exhibited in 1888 as part of the 120th Summer Exhibition of the Royal Academy. The young woman in the painting (reportedly Sant’s young niece was the model for this painting) holds a bible in her hands, her fingers marking the place where she has momentarily stopped reading. She is lost in thought, her eyes gazing heavenward. This is an image that was reproduced in a number of different contexts, and the themes of piety and serenity expressed through this painting made it especially popular for religious-themed publications. When this image was selected as the opening image for a book on Humane Education, however, it was more than the religious context that was of interest. At its heart, this painting underscores the how written words on a page could have far-reaching effects upon those who read them. Perhaps Krause and her publishers imagined scores of young men and women clutching the Manual of Moral and Humane Education in a similar fashion, pausing to reflect on the words they read, and the changes those words would lead them to make in their lives. Other paintings that were reproduced in this book include many by the well-known 19th century animal painters, Rosa Bonheur (e.g. The Horse Fair) and Sir Edwin Landseer (e.g.Highland Shepherd’s Chief Mourner). The California Digital Library has made a PDF version of this book available for download.